Roy Hart founded his post-modern performance group in 1969. His work was based on that of his teacher, the modern voice pioneer Alfred Wolfsohn. Wolfsohn was the visionary founder of the idea that freeing the human voice is intrinsically linked to the development of the person; to the disciplined liberation of blocked energies and feelings. Many experiences contributed to his ideas. He was haunted by the cries of his wounded comrades in the First World War and as he pursued his work as a singing teacher in the 1930’s, he became increasingly aware that the human voice possesses dynamics and range that are little used in expressing fully the wholeness of who we are. Wolfsohn came to London from Germany in 1939. Roy Hart was a gifted young actor who had left his studies at RADA to dedicate himself completely to working on his voice with Wolfsohn and his group of students. 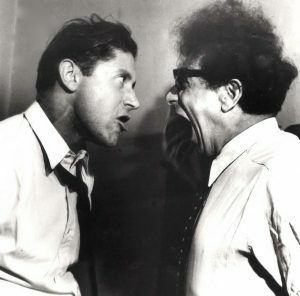 Roy Hart took on the directorship of the group after Wolfsohn’s death in 1962 and steered the work in a theatrical direction. The Roy Hart Theatre group was formed in 1969 and included several young students who had been attracted by the radical nature of the work and by their experience of how empowering freeing the voice in this way was. The group functioned in a highly disciplined way, which ran counter to some of the other iconoclastic theatrical experiments born at that time. This structured approach enabled the group to survive the tragic death of Roy Hart in 1975, shortly after they moved to their new centre at Malèrargues in S.W.France.